The Cooper Atkins 1246-02-1 pocket thermometer measures temperatures across a range of 0 - 220 degrees Fahrenheit, and is rated to be accurate to within 2 degrees. 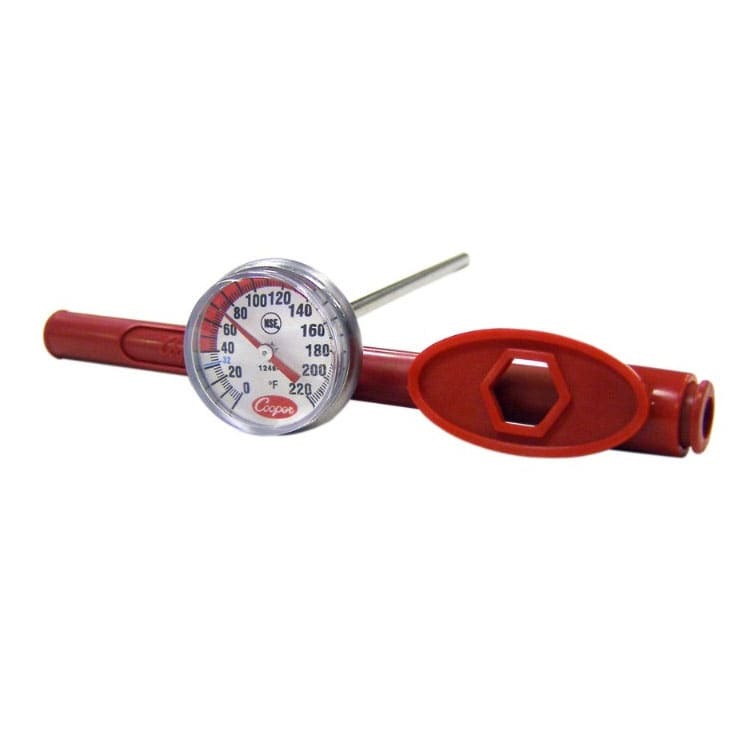 A durable stainless steel housing makes the thermometer long-lasting and resistant to corrosion, while a red protective sheath protects it while its being stored or transported. A pocket clip helps staff keep up with the thermometer. This thermometer is made with a 5-inch shaft and a 1-inch-diameter dial. The dial is covered by a magnifying lens that simultaneously protects the dial and makes it easier to read. The Cooper Atkins 1246-02-1 thermometer is NSF certified, meaning it has met the National Sanitation Foundation's guidelines for cleanability and sanitation. Pocket Thermometer, test, 1" dial type with 5" stem, temperature range 0 to 220 F, with protective sheath, calibration wrench and clip, NSF certified, carded.